About 50% of all pregnancies are unplanned. Waiting until pregnancy may be too late to prevent fetal exposure to risk factors. If we shift our attention to preconception health (PCH) and help identify, manage or reduce these risk factors we can improve reproductive, maternal and child health outcomes. To address this issue, Public Health developed an innovative and evidence-based PCH risk assessment tool for use in the primary care setting called My Health eSnapshot (MHeS). Note: MHeS is not yet available for use as we are still in the research phase. A patient-driven, electronic, comprehensive PCH risk assessment tool. Asks about genetics, nutrition, body weight, physical activity, reproductive/sexual health, oral health, chronic diseases, infections, immunizations, substance use, environmental toxins, mental health, stress, and more. Generates a customized patient handout with results and key PCH messages. Delivered using a health information technology platform called Ocean by CognisantMD. 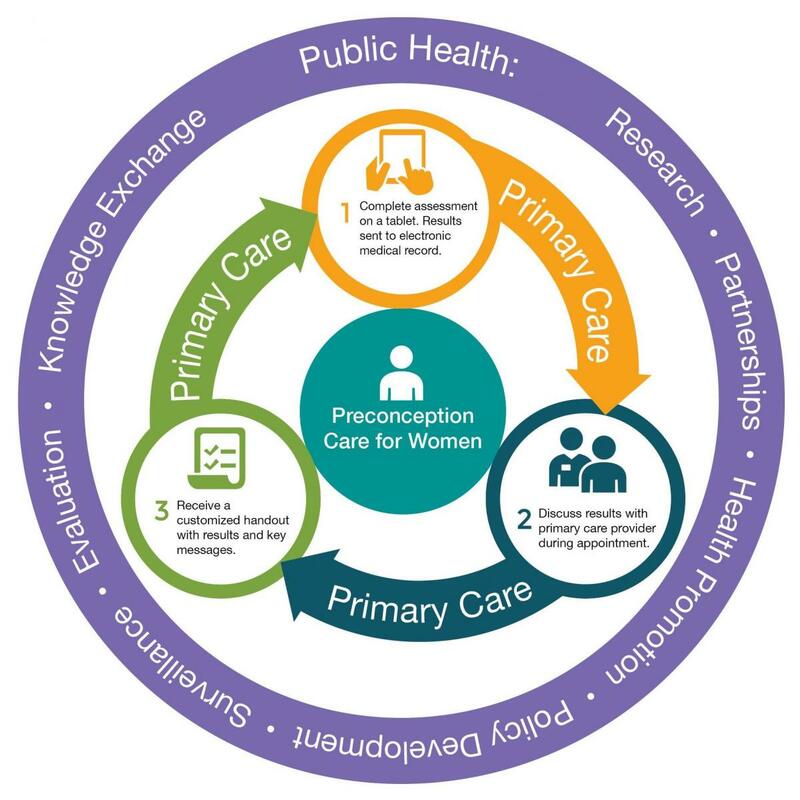 Graphic: My Health eSnapshot: An innovative and comprehensive model to deliver preconception care in the primary care setting supported by public health. This is an illustration of Wellington-Dufferin-Guelph Public Health’s preconception health intervention model. Women of reproductive age are at the core of the model as this intervention aims to improve the health status of women well before pregnancy for optimal maternal and child health outcomes. Primary care providers wrap around as the providers delivering the 3-step intervention model in the primary care setting: 1) Women complete the risk assessment on a tablet, 2) Women discuss their results with their primary care provider, and 3) Women receive a customized patient handout with results and key messages. Public Health supports the overall model through research, partnerships, health promotion, policy development, surveillance, evaluation and knowledge exchange. Complete MHeS on a tablet in a physician/PCP office with results automatically integrated into the electronic medical record (EMR). Discuss results with a physician/PCP during appointment. Receive a customized patient handout summarizing results and key PCH messages. Determine the impact of MHeS use during primary care visits with a physician/primary care provider (PCP) on PCH knowledge and behaviour among women of reproductive age (15-49 years). Identify the most prevalent PCH risk factors in the WDGPH area. Assess the process and user-friendliness of the MHeS intervention model.